Shadow the Hedgehog****. sorry if i'm overwhelming tu with pictures.please visit: www.shadowsgirls.webs.com (copy and paste in url). Wallpaper and background images in the shadow el erizo club tagged: shadow the hedgehog shadow sonic sega. i laughed SO much ITS SO FUNNY!!!!!! *Stuffs cookies in mouth* "WHAT ARE YOU GUNNA DO 'BOUT IT, HUH?!?!?!?" *Shadow pulls out chaos emrald" "Chaos... TACO!!!" Please don't eat me ._. sonic]man these coookies are good. sonic]yeah because you met rough. me]shut up.its just a cookie. me]no shadow i will not marry you. shadow]why dont you like me. shadow]you what......why do you alwas ruen my life. SonicChief150 your story made me almost pee on myself!!!!!!!!!!!!!!!! !it was funny!!!!!!!!!!!!!!!!!! Hahahahahahahaha! *calms down* that's funny as and looks cool he is doing chaos blast lol. Me: *looks at cookie* Sonic, is this your cookie? Shadow: *big smiles and breaks cookie in half* Here, for you! it would be funny in like the back of the pic you see sonic with a plate saying "hey shadow got any more?" Shadow: WHAT THE H**L HAPPENED TO MY COOKIE!!! Shadow: <points gun> WHER IS IT!? Shadow: e.o really? o_o ... oh, ok then. Shadow: Silver! WHAT DID U DO WITH MY COOKIE!? Me:Omg has hadow gonne crazy?? LOL!! That is so funny! why meeeeaan people must eat the nice mans cookies??? why!!! why!!! but...yeah.LOL!!!!!! i have nothing better to do but laugh!!!! why is he so funnlink i llink shadow! MY ANOTHER STORY=*me,sonic and silver staring at cookie*sonic-sparky is this your cookie?me-no!Duh!i would off ate it!sonic-yours silver??silver-no,sorry. *shadow walks in the room*sonic-Shadow is this your cookie? please say no! 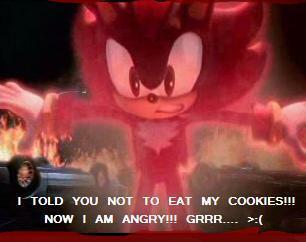 !shadow-yes its my cookie>why did you ask?sonic um..no reason. :(*shadow walks out off room*me-boys if we want that cookie her the plan*me pick up cookie and split it in 3 parts and hand them to the boys*me-eat it fast!or he'll kill us!! Shadow: YOU ATE MAH COOKIE U SHALL DIE!